As I stand at our clinic window, wanting to write part two as a follow-up to my previous post, I am actually at a loss for words. I had written this post in my mind while writing the last post, however, I am currently utterly at a loss for words. I can sense the words hanging out, deep beneath the surface, but I experienced a healing session with tuning forks yesterday, and I must say, I still feel a bit like a deer in the headlights. It was a very profound experience. At one point during the session, I felt and almost heard a subtle but distinct 'pop' followed by an immediate sensation of something popping out of my solar plexus, which I'll explain more below. The session involves combing through our human biofield with tuning forks. The energy field that while invisible to the eye is very real, and contains information representing our history of experiences. When we experience trauma, injuries, or major turning points and challenges, it is registered in our subconscious, which perhaps is likened to our human biofield which extends a few to several inches off of and surrounding our body. When striking a tuning fork beginning at the outer reaches, it is creating varied tones, some clear and smooth, some stifled or 'off' that indicate a potential 'hit' to our energy field at various times in our perceived chronological lifespan. (I say 'perceived' because we think of time being linear, or a real construct, but it isn't, however it's a measure we use in our everyday reality of duality.) So, for example, if my energy field extends out 12 inches to my right, and the practitioner is working off of my solar plexus area, the outer boundary of my energy field would relate to my birth. The closer in to the body, the closer in to my current age. There are a lot of different tuning forks. Some reviewers use this particular one to help them with headaches, and just general health improvement, and relaxation. There are many different systems of sound healing. I put the picture of it from Amazon here more for showing those who are not familiar with tuning forks. It is not necessarily the one I recommend. It has great reviews, but I have not yet read which forks are recommended by Eileen McKusick, author of Tuning the Human Biofield, discussed below. According to this system, based on the work of Eileen Day McKusick, author of Tuning the Human Biofield, the right side of the body will reflect issues with 'father/paternal' guardian, and the left would be issues corresponding to mother/maternal guardian. Each area of the body, beginning with the feet and moving up, would also correspond to different life issues, and the corresponding organs or endocrine system glands. As she (I'll call my practitioner 'Ann' from now on, as she isn't yet aware of my writing this, and I am not sure she wants her name given) was working through my energy field, off of my solar plexus area ~ the seat of our power and professional identity ~ I was able to sense/feel fleeting sensations. I would also have fleeting images, or impressions of places, depending on the time period she was working on in my energy field, beginning from the beginning, or outer most reach and working inward. I could sense or would have very brief images or impressions of our first house that we lived in until I was about 11 years old. It was a great old victorian house, and it was fairly traumatic to have to move out when I was still young, simultaneous to my parents divorcing. runway, here I come, lol! 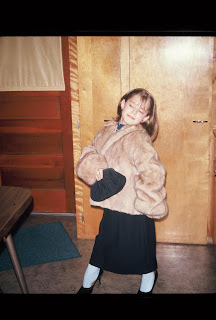 Yes, I was an introvert, but I still had my moments! As she continued through to my teen years, I could simultaneously be holding the consciousness of my neutral witness, or present day adult ~ who knows just how much I have worked internally to change the trajectory of my life ~ while also 'feeling' the feelings of the me of the ages she was working on. At about age 13/14, a heaviness set in. I could recall in my present adult self that me that went through quite a depression. I was very alone. I had major energy crashes. 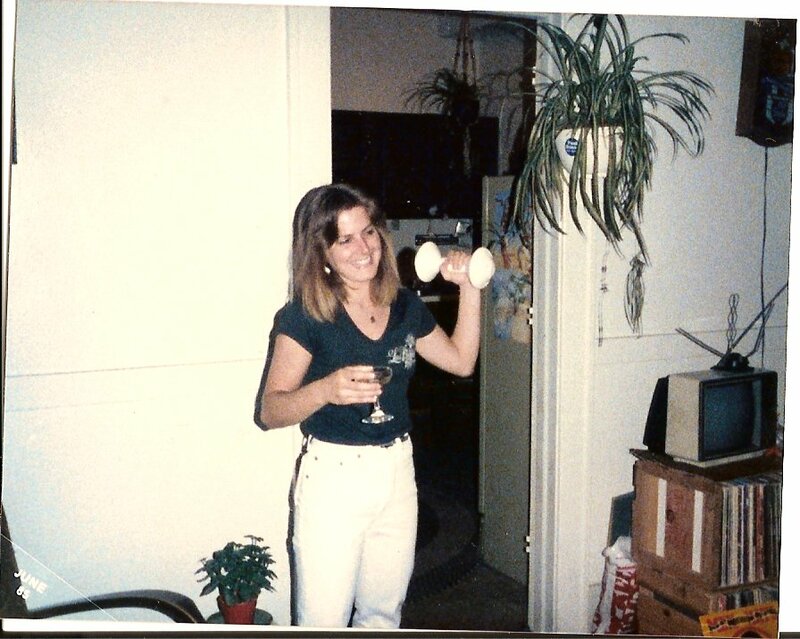 I believe now in retrospect that some of my slump was nutritional. The early warning signs that were not heeded of hypoglycemia, or issues with excess sugars and carbs, and a history of anemia. Once I got a job, and started track while in high school, it helped me to overcome the slump. It was a time when my mother worked evenings, my sister was away, and I was often alone. I would come home from school, slump into the couch and watch t.v. for the evening. It felt a bit like being in a coma, paralyzed or glued to the couch as if a giant magnet underneath was pulling me down, while I mentally escaped my lief while watching the Brady Bunch, The Partridge Family, I Dream of Jeanie, and even Gilligan's Island. 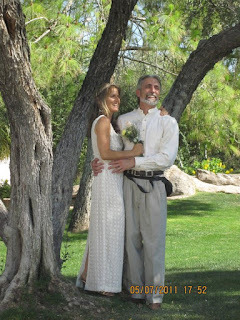 As Ann continued working through my human biofield, into my young adult years, and beyond, the emotions started to well up a bit as I could feel just how much of my life was tinged with struggle, pain, and all the symptoms of what I now summarize as being out of alignment. And although the emotions were just beneath the surface, my adult me continued to be the main driver, just sensing with compassion all that that old me endured. 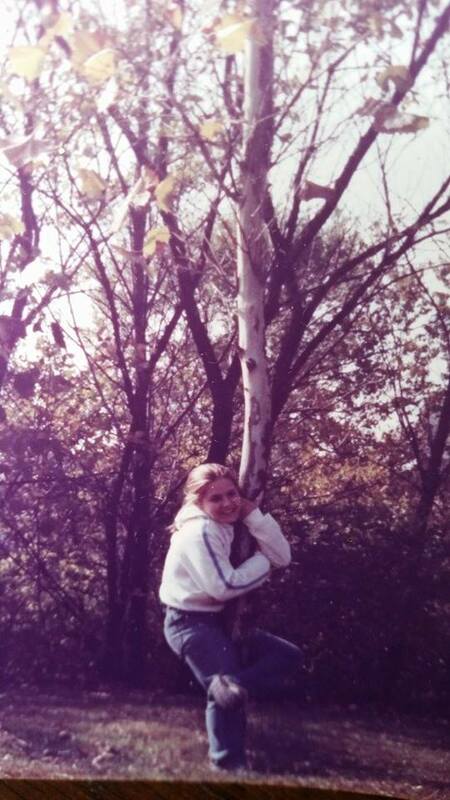 1981 at college, hugging a tree. Some things never change! 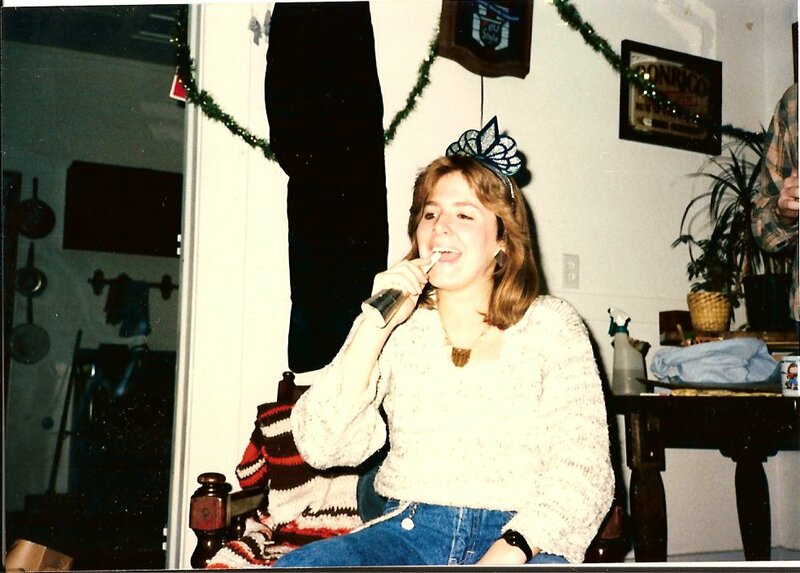 I certainly did my share of drinking while in college (and beyond.) 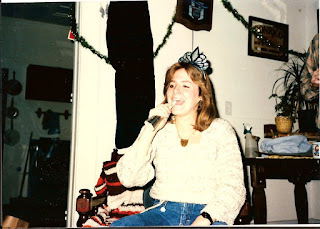 I believed I was pretty uninteresting and shy when not drinking, so I drank to fit in and become more 'uninhibited.' Sound familiar, anyone??? If this relates to you, and you are still young, find those who can appreciate you for who you are. Stay home. Read. Be with your family. Play outside. Don't let these habits become your way of life. Use your time and life force to improve yourself, grow and learn. I don't know how to explain the sensation of never feeling totally embodied, however, others with this experience know exactly what I mean. I felt like I was never 100% present, and grounded into my being, which fueled some of my growing insecurities. I felt like I was operating most of my life with half of a battery charged. As I looked back, from my current vantage point, I was in awe as to all that I managed to still accomplish, despite missing half my life force, power, vital qi, or whatever is the appropriate label. As Ann closed in on my body, working through the last decade of my life in my biofield, she explained how the energy closer in towards the body is denser, and therefore less distinct to be able to read. At this point, a sound healing practitioner will begin to 'scoop' out the energy back into the area of the body, which for me was my solar plexus. greater the rewards when we put in the time, and are willing to do the real inner work. I do energy healing work and am very clairsentient. I feel the energy field surrounding the body as I do most of my energy healing work for others in this area. Most energy healers work with hands on, but for me, the magic happens in the outer energy field, where incongruence or snags/distortions in the energy field can become smoothed out and corrected before becoming solidified into physical symptoms. It appears similar to Qi Gong medical practitioners, as I am waving my arms in spirals and circles or other shapes above and around the client, 'dancing' with the energy field as a bird dances with the updrafts, and takes to the sky. This work is quite appealing to me because much of what McKusick has written has been my own direct experiences as well. It was brought to my attention by Ann, a client of ours who recently went through the first level of training, and is now doing her 'practice' sessions. Lucky me! As I mentioned earlier, when I felt that sensation of something popping out of my solar plexus, I was instantly catapulted into deer-in-the-headlights mode, or a mild state of shock. That's when the floodgates broke. A gush of emotions sprang forward. I felt confused, or like a lost child. My neutral witness remained, but she slipped into the background, no longer as capable of still maintaining the keys to the car. I had that definite feeling of one part of me being over here, and one part of me over there like the scarecrow from Wizard of Oz which I had previously experienced when I first arrived in Arizona. I A woman that does readings informed me that my emotional body had separated from me. It was exactly how I felt, however, up until that moment, I would not had known how to describe it or what to do. She prescribed a few energy healing sessions. This was at Vision Quest. A guy was offering Reiki/energy healing by donation one evening per week. As prescribed, I went three times, and finally felt more integrated. As it turned out, more of me 'came in' during another round of Reiki attunements while attending Southwest Institute of Healing Arts that first month I was here. It really marked the beginning of an entirely new level of healing and evolution for me, which started before I moved out here, then ultimately included meeting Don, getting married, and going from paleo to vegan back to our current hypercarnivore diet. I previously mentioned doing an online test years ago through the book, StrengthsFinder 2.0, Discovering Your Clifton Strengths, by Tom Rath, in which two of my five strengths were connectedness, and empathy. I must do my best to connect in writing the dots that so seamlessly connect in my brain. How could anyone else possibly know the full impact and extent of the experiences behind my words, and the many challenges and ah ha's in between that I have yet to share? I still feel this deer in the headlights feeling. When I write, my focus keeps me going. Some words manage to come out. I am not sure from where. When I stop, my mind is lost in space. I can't focus on a thing. Some aspect of me, perhaps a higher self aspect, is keeping me going. I am sure to clients I look and sound 'normal' but internally, I feel anything but. I know that I truly have done good inner work healing from the story of my past. But even still, it is difficult to know how much the imprints of so many challenges and disappointments are residually lingering in our energy field, despite the mental/emotional resolutions that have already occurred. I know from experience that sometimes we have to work things out physically, not just mentally. Whether we get deep tissue massage, pound the crap out of a garbage can with a stick, yell and scream for ten minutes straight, or put on some fun upbeat music and go to town shaking all that energy out, we need to do something to move the stuck energy. Thankfully, I have an awareness of dealing with trauma, and the psychology involved in helping people heal. I am able to do my best to integrate and process these feelings without getting totally caught up into it, or freaked out by the strange sensations I experienced. According to McKusick, people may have a strong detoxing reaction from this work. She had observed with nearly every client a particular block of energy that most of us experience between the second and third chakras that prohibits our energy or vital qi from fully circulating through our entire system. According to McKusick, she became made aware of just how many of her clients were having major issues with their fathers. Whether they were emotionally unavailable, always working, or worse, when the basic "acknowledgment, approval, and affection" needed as we are growing up from our male/paternal father figure is lacking, it leads us to deal with it in many often unhealthy ways. In the absence of this reflection of our own inner brilliance that a healthy relationship with one's father can provide, many people end up unconsciously seeking to get those needs met as they go through their lives, engaging in guilt-driven overdoing, experiencing feelings of low self-worth, seeking approval, and routinely putting other's needs ahead of their own. I know that my less than stellar relationship with my father had a big impact on me, but I never previously read it summed up so perfectly. As a result of all that I went through of emotional pain and challenges, I adamantly oppose non-traditional families, with children being raised by single moms without the male role model. I believe the healthy development of children rests on having two healthy parents providing the archetypal energies of the male and female qualities. These are inherently different among males and females in all of Nature. Women may believe they are super heroes, and can do it all ~ work and raise their kids alone ~ but the emotional melee brewing beneath the surface of the child who keeps it all locked up inside reveals the truth. Kids don't know how to articulate what they need, and what is missing. They 'know' but they act according to acceptable norms. Don't get me wrong. I have upmost respect for those mothers who are managing as best as possible to raise their children, single or not. It isn't always one's first choice. But those who choose it without giving a thought to whether or not it is best for the children lose a bit of my highest regard that I have for parents. I think parenting is the most important (and potentially most challenging and rewarding) job of all time. Getting back to that pop out of my solar plexus, perhaps I have lived with such a limit on my power for so long, I had a spontaneous fear of actually allowing the fullness of my power to return. On Tuesday evening, I did not sleep well. I felt a strong call to go out onto our balcony at around 2:00 or so AM. I have a couple rubber mats and a blanket set up with pillows in a small little area, just wide enough for me to lie on my side, curled up in the fetal position. With a thin batiked cloth cover, I laid there, feeling embraced by the Earth Mother like a young child. I finally experienced the feeling or sensation of something I had previously concluded ~ that Mother Earth is our true source of sustenance and abundance, on every level. I felt a sweet surrender into her welcoming embrace. Two days later, and I feel less in shock, but still not 'normal'. I am getting more accomplished, but if I could, I'd be doing very little other than reading, and day dreaming on the balcony. I am filled with thoughts about this human life of ours. A lot of craziness. So much loss of life experienced as we spend our resources just trying to right ourselves. This was a long post. I know one reader doesn't like my long posts. Oh well, hard to make this brief and get a point across. But since this session happened, my original intent to follow up on the previous post with what all has been materializing as a result of those readings will have to remain until the next post, which I'll get on asap ~ unless I just 'can't' then I won't ~ but preferably before any remaining thoughts of it escape me altogether. My mind is no longer under the will of my smaller self/ego, intellect. I can't push against the currents of life anymore. 💙🔥💙This was a beautiful post, Tracy. It's not too long but "just right" for what you needed to share with us. Thank you. Keep being and expressing everything that is uniquely you & Don. Being "mindless", or a deer in the headlights, is key to being a living embodiment of Divine Love. Shine bright, M'Lady. I Love You.